This MFC-J265w is a compact All-in-One ideal for the small or home office user. The wireless (802.11b/g) network interface enables sharing with multiple computers on a network. Built-in fax allows you to send and receive documents without using your computer. The 1.9 color LCD display located on the control panel is perfect for viewing images and easy menu navigation. Convenient Built-in Fax. No PC required to send and receive documents via stand-alone fax. Fast Color Printing. 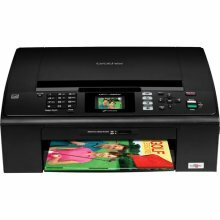 With speeds up to 33ppm black and 27ppm color. Direct Photo Printing on Demand. Print photos on demand directly from your memory cards. Versatile Scanning Capabilities. Can scan directly to E-mail, File, OCR and more, using a variety of formats including JPEG, TIFF and PDF. Professional Printing Resolutions. Print borderless photos with droplet sizes as small as 1.5 picoliters and high resolutions up to 6000 x 1200dpi. Flatbed Copying and Scanning. Flatbed copier allows you to copy bound, thick or odd shaped documents. iPrint&Scan. Free app download for wireless printing (JPEG images) from and scanning to your Apple iPhone, iPad or iPod touch.